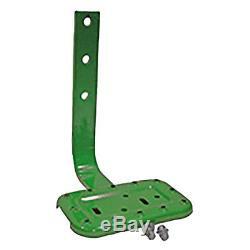 One New Aftermarket Replacement John Deere Step and Bracket that fits Tractor models: 830 (UTILITY), 1020, 1520, 1530, 1830, 2020, 2030, 2040, 2130, 2240, 2440, 2630, 2640, and 2840. 2 1/2 between Mounting Holes. Mounting Holes may need to be englarged for some models. PLEASE NOTE: Bracket made in USA, Step made in China. Sale Depends on Stock at the Time. Only the 48 contiguous States in the U.
JDS759STP&BRKASSEM, T25703 (Bracket), F3195R (Step). The item "John Deere Step and Bracket 1020 1520 1530 1830 2020 2030 2040 2130 2240 2440 +" is in sale since Tuesday, November 1, 2011.